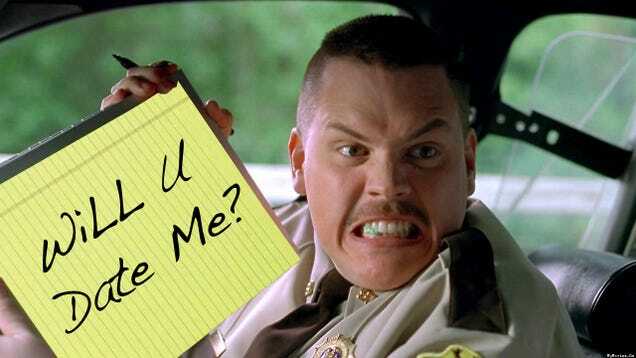 A Chicago police officer is being sued for violation of privacy because he used DMV Database to look up the address of a woman he recently ticketed... to ask her on a date! (see full story here). So you tell me... is it cute or creepy? Photo taken from this site...too funny not to share! Police officer Chris Collins decided to leave a note on this woman's car! I'm thinking he should have called instead of going to her house, maybe a little less intimidating. This is the highlights of the note: "It's Chris. I'm that ugly bald Stickney cop who gave you that ticket on Saturday… I have not stopped thinking about you since… I did cost you $132 least I can do is buy you dinner." Creepy, something similar happened to me a couple of years ago and I was scared to death! I am just another blogger mom too btw! Come to visit my blog and if you want let's follow each other through bloglovin and GFC! Thanks for stopping by Carrigan's Joy! Yeah I can't really decide. I was talking about it last night, & I think it would really depend on if he gave off the "creepy" vibe! Either way, I don't think I would have sued him though! hmm, but if he was icky.. I might had said creepy. But wouldn't sue him, girl definitely might have the sue syndrome. I can maybe see where she got the "creep" feeling, he could have gone about this all differently/better... but some people just really lack the knowledge! & it's hard to tell in a note if he was joking or what. I wish I knew what he looked like!